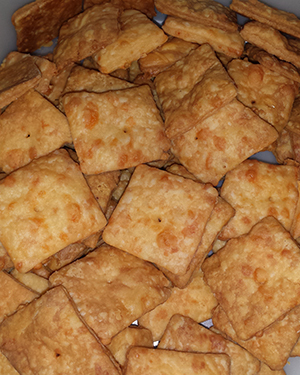 Cheez-its and Goldfish cheese crackers are among the world’s most delicious and addictive foods. But if you really think about it, they’re almost exactly the same flavor presented in slightly different crackery shapes. My husband, Leo, loves Cheez-its, but they’re a little higher in calories than he wanted. So we had opted for the Fit and Active brand “cheesy squares” (as they’re called in our house) from Aldi. Then one day, we discovered a terrible thing that is something any Aldi shopper needs to learn: Aldi often phases out your very most favorite product. Gah! And so the quest began: time to make our own cheese crackers. 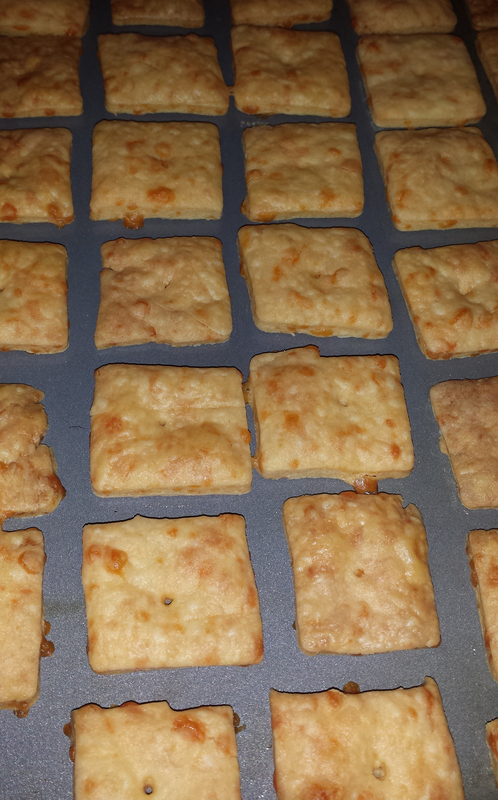 Even though I knew we’d eventually figure out a good substitute, I decided to try making homemade Cheez-its, and came across a couple of good recipes. I tried them, found them “not quite right” and had to start tweaking. The holes appear to be entirely decorative. Generally, as my friend Melissa reminded me, holes like this are intended to keep the baked good from puffing up too much. I tried these with holes and without and it made no difference. I think they’re just too thin for the hole to matter, but I don’t really know. There are two key problems with making Cheez-its at home. But the other use of cream of tartar, and one that’s important here, is that it’s often used to create a buttermilk substitute. And it’s used in snickerdoodles. Why? Because it creates a slightly sour “tangy” flavor. And darned if adding a few teaspoons of cream of tarter didn’t do the trick! Cheez-its are crispy, thin, and light, and they stay crispy for a long time in the plastic bag in the box. However, every recipe I found said that the homemade versions would only be “good” for two days. After making my first batch, I figured out why: the homemade versions sucked in moisture from the air and transformed into something far more reminiscent of Red Lobster cheesy biscuits. It turns out that achieving the perfect Cheez-it texture is difficult, if not impossible, at least for an amateur like me. But I’m satisfied that this recipe stays crispy for a much longer period of time than two stinkin’ days, however they may not last that long in your house. It’s hard to make them last in my house. The best texture is one that comes with rolling out the dough to 1/8″ thickness and baking a little longer than most other recipes call for. Make sure you roll that dough out evenly. 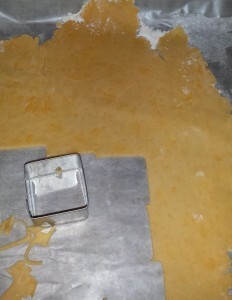 I used a cookie sheet lined with waxed paper and dusted with flour to roll mine out, and I even used some flour on the rolling pin to keep the dough from sticking. This is what the dough looks like. The cheese tends to clump up a little, so get in there with your wooden spoon and move things around so the dough can get more mixed. Roll the dough out thin. Don’t mess around. If you think it’s too thin, it’s probably just right. Make sure it’s even and start cutting into squares. When you’re done cutting, take the scraps and mush them into a ball and mix that with some more dough. You can use all the scraps, so keep forming all the scraps into a ball and rolling it out until you run out of stuff to cut! When you put them on the pan, they don’t need much room in between. Just make sure they’re not touching. This is what they should look like when you decide to take them out of the oven. You may have to experiment with your oven. 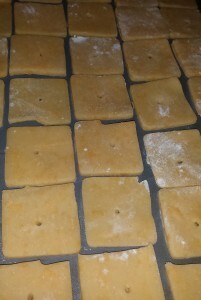 For example, my oven heats a little unevenly, such that, when I realized I had a section that I hadn’t rolled out quite thinly enough, I put those squares on one side where I know my oven heats a little hotter than on the other side, so the crackers cooked evenly overall. 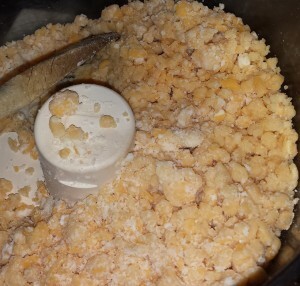 Place shredded sharp cheddar cheese, butter, flour, salt and cream of tartar in a food processor. 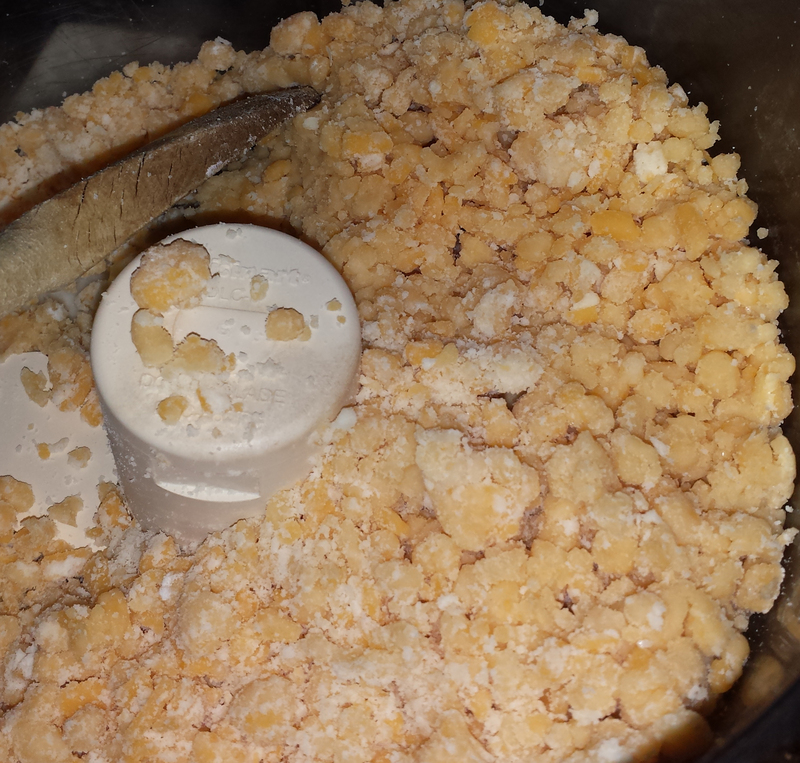 Alternate between pulsing and running the processor until until the dough turns into coarse crumbs. You may have to turn off the processor now and then to get things moving, as the cheese and butter sometimes jam up the machine a little. Take a large handful or two of dough, form it into a ball, and roll it out onto a floured surface. 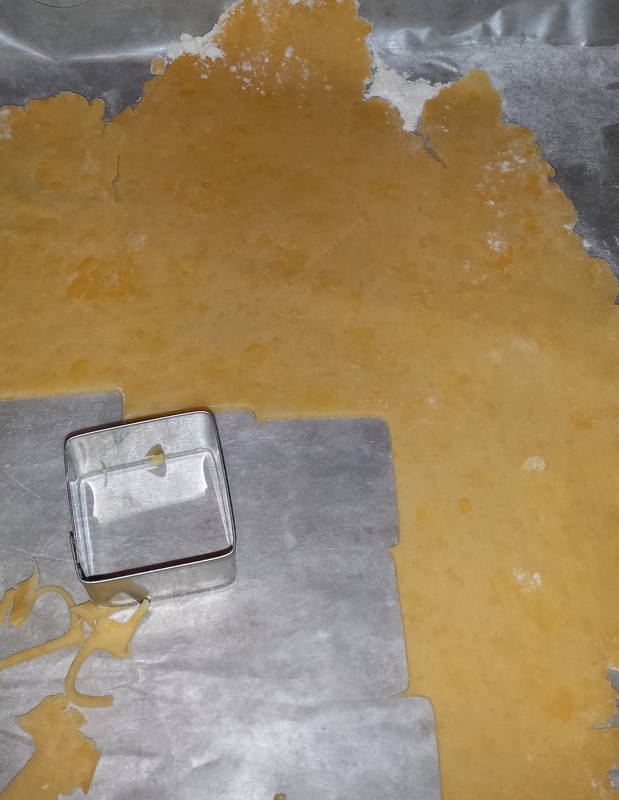 Try your best to roll into a rectangular shape and until the dough reaches about 1/8" thickness. Make sure your dough is rolled out evenly. 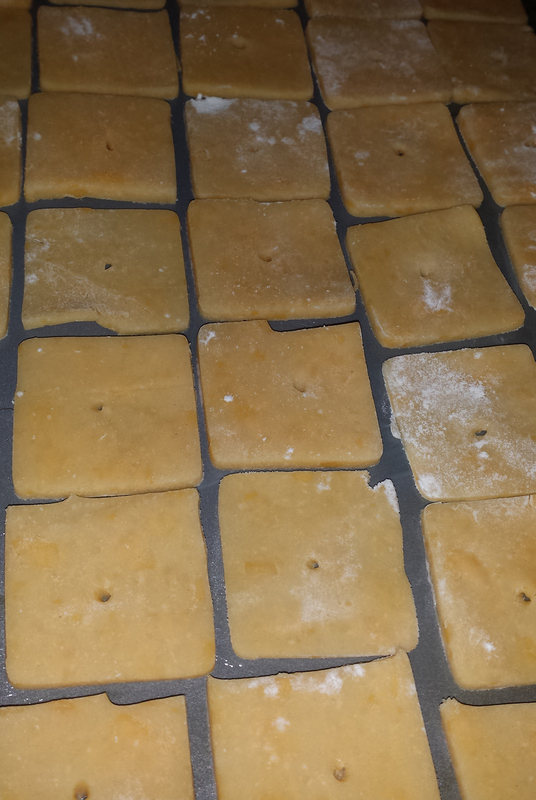 With a pizza cutter, pastry cutter, knife, or an hors d'oeuvres cutter, cut dough into 1" squares. Use flat end of a wooden skewer to poke a hole in center of squares. Place crackers on a greased baking sheet with at least a little space between them. Bake 18-20 minutes. Store any not being eaten right away in an airtight container.